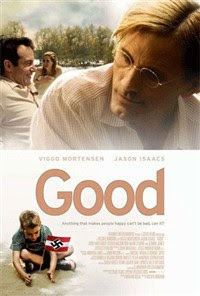 Good examines the life of everyman John Halder (Mortensen), a good and decent individual with family problems: a neurotic wife, two demanding children and a mother suffering from senile dementia. A literary professor, Halder explores his personal circumstances in a novel advocating compassionate euthanasia. When the book is unexpectedly enlisted by powerful political figures in support of government propaganda, Halder finds his career rising in an optimistic current of nationalism and prosperity. Seemingly inconsequential decisions lead to choices, which lead to more choices - with eventually devastating effect.